Hedrich Blessing captured this photo of Prentice soon after construction. Anyone who has seen Prentice Women’s Hospital is immediately struck by its unusual appearance. And if you’ve walked around Streeterville in Chicago, you quickly realize that Prentice looks like nothing else in the neighborhood. In fact, it doesn’t look like anything else in Chicago, except other buildings designed by Bertrand Goldberg . 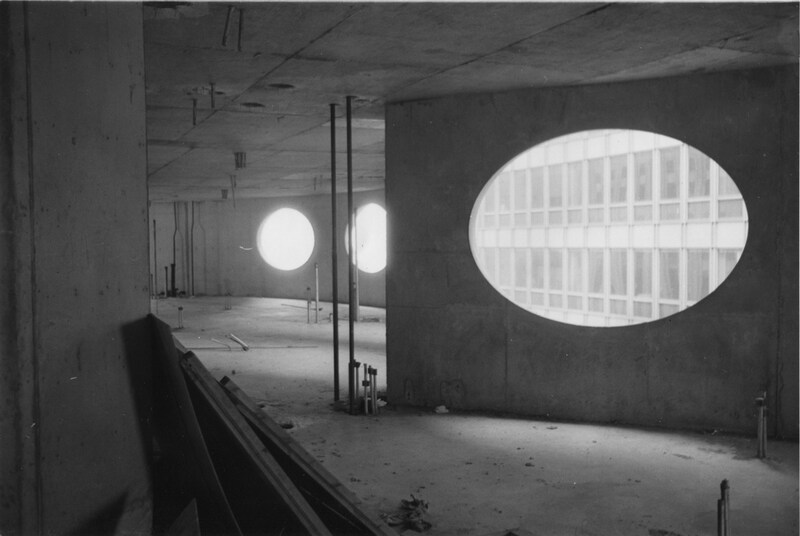 The four curved concrete lobes that make up the seven-story tower are both harsh and sensuous at the same time. It is this contrast of hard surface, rounded curves, and a strictly rectilinear base of dark glass and steel that makes the building so unique, and so uniquely Goldberg. 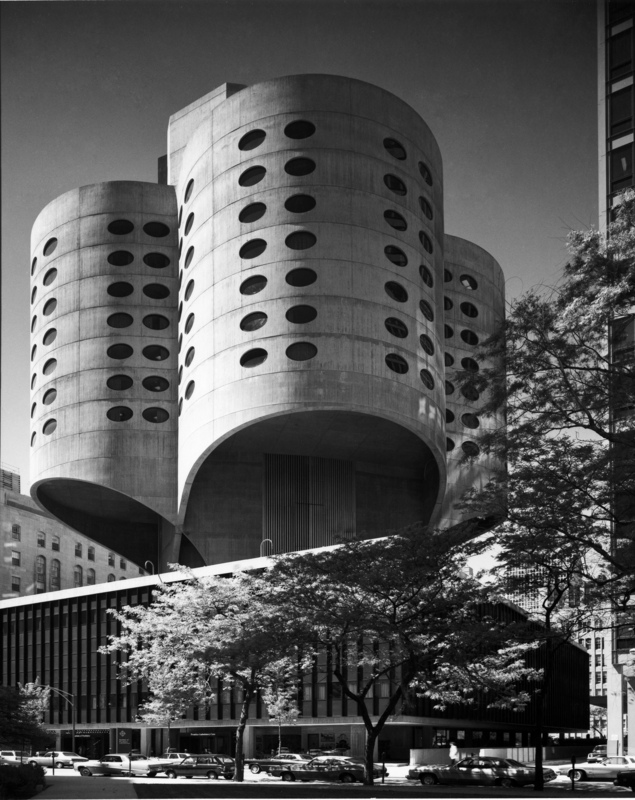 Northwestern commissioned Goldberg in 1968 to design Prentice Women’s Hospital, intended to be a new maternity hospital providing Chicago with the most advanced obstetric care. By this time he was well known for his design and planning of large university medical centers at Harvard, Stanford, and the State University of New York at Stony Brook. Although other architects avoided health care projects because they felt the programmatic requirements limited their freedom and creativity, Goldberg embraced the challenge. In Prentice, as at his other hospitals, the program and the usage of the internal space actually inspired his planning process and shaped the external form. From 1968-1970 Goldberg considered a number of options for the plan of Prentice, exploring hexagonal rooms, clusters of towers, a series of concrete tubes, and a ring of “pods.” But it was the discovery of a radical new engineering solution in 1971 that led to the selection of the unique quartrefoil tower plan. Using computer-aided design and modified software from the aviation industry, Goldberg’s team developed a system of curved concrete shells with intersecting arches, which allowed the tower to be cantilevered forty-eight feet off the core. This solution also eliminated internal supports, opening up the floor plans for greater flexibility of use and freedom of movement inside. The flexible design was also an effective means to combine a number of functions within a single structure. The building allowed Northwestern Memorial Hospital to consolidate their obstetrics and gynecology departments (Prentice Women’s Hospital), and psychiatry departments (Stone Institute of Psychiatry) under one roof. It is this same flexibility that would now make Prentice an ideal candidate for many new uses, ranging from hotel to office space to laboratories. 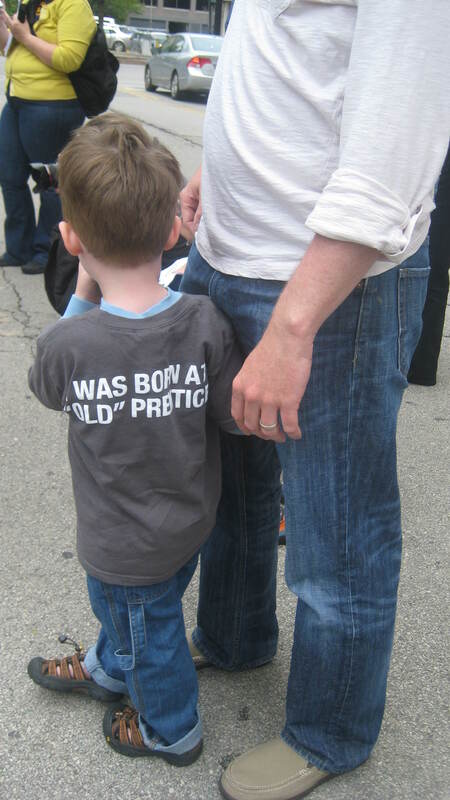 Prentice Hospital provided maternity care for several generations of Chicago residents, but it was operating at well over its planned capacity. A new, larger Prentice Women’s Hospital was opened by Northwestern Memorial in 2007, less than a block away from the original. While the concrete tower of “old” Prentice has been vacant for several years, the Stone Institute continued to operate in the base until 2010. When the Stone Institute left the building, ownership of Prentice reverted back to Northwestern University, who claims it no longer meets their needs. Goldberg’s influential Modern masterpiece is now completely empty and its fate is uncertain. i wish i had a good piece of insight to give to you but i dont .i will say this i remember being inside the building back in the early 80s with my father before he passed and being amazed by what i saw looking at the oval windows and surrondings ,he passed in 1984 of cancer .recently my aunt was diadnosed with a brain tumor and spent two months in northwesterns intensive care and then moved to the 8th floor of the rehab center at 345 e superior , a perfect view into the tower of old prentice which i had not seen or even thought of since i was there with my father. the amazement that i felt as an 8 year old boy had returned . only to find out that the university is planning on demolishing the building. if there is any way i can help save the building for my grand kids to enjoy please let me know . Do you wonder what the outcome would have been had Michael Reese hospital been restored rather than razed? What lessons are to be learned concerning other endangered structures? 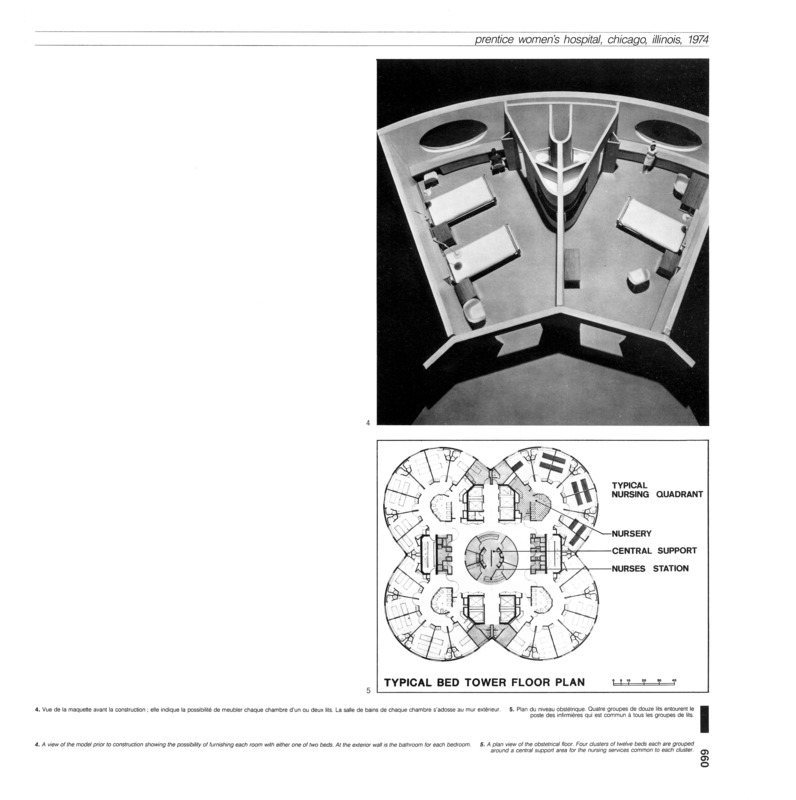 Does Gropius’ vision provide insight on how to use the site now? I’m developing a project to address these and related questions. Any opinions or insight the authors could lend would be greatly appreciated.